Sheep took over the main floor of Ogilvy as part of a charity breakfast event launching The Prince of Wales’ Campaign for Wool in Montreal for the first time. Sheep from a Montreal-area farm and dancers dressed as sheep from the acclaimed Bouchardanse production of Les Moutons mixed with guests gathered to celebrate the debut of Canadian Wool Week (Sept. 19 – 27) in Quebec. Ogilvy on Saint-Catherine was the location for a series of Canadian Wool Week related activities. Holt Renfrew Montreal played host to a pop-up wool shop featuring an array of curated Canadian wool items, items from HRH’s Highgrove housewares line and hand-knotted wool carpets from Afghanistan provided by HRH’s Turquoise Mountain charity. Proceeds benefit Prince’s Charities Canada and The Campaign for Wool. 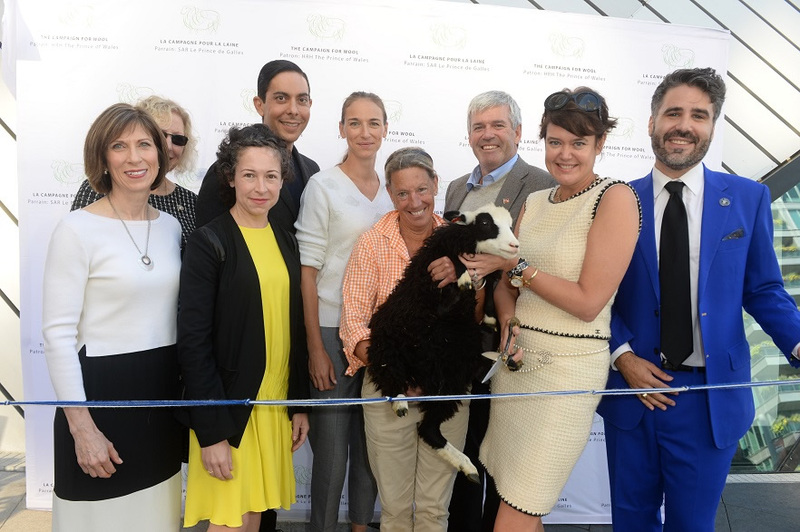 Iconic Quebec-based knitwear maker ça va de soi also got into the Wool Week spirit using the occasion of their 25th anniversary party at Ogilvy on Thursday evening to support The Campaign for Wool’s debut in Quebec. An installation of live sheep and a knitting circle in the Royal Ontario Museum’s (ROM) Plaza played centre-stage to the 2015 Launch of Canadian Wool Week part of The Prince of Wales’s Campaign for Wool. Wool Chair and Canadian design icon Kimberly Newport-Mimran was joined by Susan Horvath, President & CEO of ROM Governors, Alexandra Weston (Holt Renfrew), Arthur Potts, MPP (Government of Ontario) and Canada’s Wool/Sheep Industry for the official “yarn cutting” launching a series of activities in Toronto focused on educating Canadians about the many properties of wool and the local economies it supports. The sheep installation was supplemented by a Wonders of Wool activation inside the ROM highlighting the science behind this natural fiber and explaining the Wool Industry’s rich heritage in Canada as well as a children’s play area featuring FELTRO magnetic wool tiles (think Wool Lego). Those activities formed part of the ROM’s Wild Science Big Weekend, running from Saturday, September 19 to Sunday, September 20. This special weekend was jam-packed with activities for visitors of all ages. Other activities include a curated a pop-up wool shop at Holt Renfrew (Bloor) starting September 19 and 20 and featuring an array of curated Canadian wool items, items from HRH’s Highgrove housewares line and hand-knotted wool carpets from Afghanistan provided by HRH’s Turquoise Mountain charity. All proceeds benefit Prince’s Charities Canada and The Campaign for Wool. The pop-up shop was animated with incredible designs provided by LINE Knitwear. The Calgary Holt Renfrew played host to a pop-up wool shop featuring an array of curated Canadian wool items, items from HRH’s Highgrove housewares line and hand-knotted wool carpets from Afghanistan provided by HRH’s Turquoise Mountain charity. All proceeds benefit Prince’s Charities Canada and The Campaign for Wool.